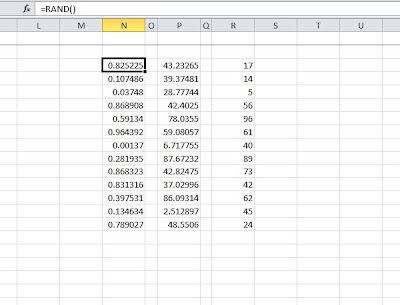 Home » Pro Excel Tips » Excel Tip #8 - How to Put Random Numbers in Excel? Excel Tip #8 - How to Put Random Numbers in Excel? Why would you ever want to put random numbers in excel? As an auditor, you make test selections from large sample of data. For example, if you were looking to test revenue transactions, you want to make sure that revenue actually exists, is accurate, occurred in the proper period, etc. You might get a detailed listing of all revenue transactions for the quarter and pick a couple selections to "follow" the transaction through or obtain support for. This revenue listing could be thousands of excel pages long. You would probably need some way to pick your samples. With a random number generator you would be able to do just that. You can randomly assign each selection with a number and then sort by that number. This would give you a list of randomly selected sample sizes. Alternatively, if you were looking to randomize the list, assigning a number would also work. Here are the formulas for generating random numbers. =RANDBETWEEN(low,high) - For a random integral number between the high and low number. Fill in low and high with your desired range. For example, =RANDBETWEEN(5, 100) would give you numbers between 5 and 100.